In an era where the European Government has been continually promulgating an energy efficient low carbon economy, Europe inland waterways vessel market stands to gain exceptional prominence in the coming years. Inland waterways transport, on European corridors, has always been a competitive alternative to road and rail transport, ensuring a more sustainable environment friendly mode in terms of harmful gas emission, energy consumption, and noise. For the record, more than 37000 kms of inland waterways in the continent connect hundreds of industrial belts and cities, particularly in Western Europe. Furthermore, estimates claim, almost 21 out of 28 Member States of European Union have inland waterways with interconnected waterways networks in 13 states. 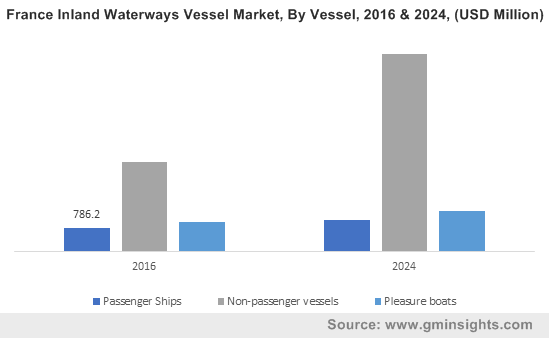 The extensive share of inland waterways transport facilities in the continent is aptly depicting the growth potential for inland waterways vessel market in Europe. If there is one iota of detail that is obscurely obvious about European inland waterways vessel industry, it is the fact that the business space is highly driven by regulations. The European Commission has been constantly working on improvising the legislation, in a bid to facilitate the integration of inland waterways transport in intermodal logistics chains. For instance, in the year before last, the Netherland Presidency had apparently inked an agreement with the European Parliament, dealing with the revision of standards concerning the technical requirements for Europe’s inland waterways vessels. For players operating in European inland waterways vessel industry, this is a vital pointer that should be taken into consideration. Elaborating further, for the record, prior to the enactment of this revised standardization, technical requirement for vessels operating in Europe Inland waterways were under the Directive 2006/87/EC, while those operating on Rhine were under the canopy of CCNR (Central Commission for Navigation on the Rhine). However, maintaining an equivalence between the certificates issued by these two regimes has proved to be difficult for Europe inland waterways vessel market giants. The latest reviewed proposition implemented by CESNI (The European Committee for drawing up standards in the field of inland navigation), reportedly, would be applicable for vessels operating both on river Rhine and EU’s inland waterways. In the light of this scenario, it is apt to infer that the profound backing of administrative bodies is influential and has much to contribute in Europe inland waterways vessel industry size. Strongly characterized by energy efficiency, reliability, and more capacity of energy exploitation, European inland waterways vessel market is slated to cross a major revenue benchmark in the coming seven years, exceeding a valuation of USD 115 billion by 2024. The figure is almost double of its revenue collection of USD 55.85 billion in the year 2016, which is deemed to be a positive indicator for the overall growth prospect of the market. While speaking of the commercialization potential of European Inland waterways vessel industry, it has been observed non-passenger vessel accounted for almost 60% of the overall revenue share. An estimation further validating the aforementioned declaration - in 2016, total volume of good transported through Europe inland waterways was almost 554 million tonnes, an approximate increment of 0.9% compared to what was recorded in the year 2015. The sheer popularity of non-passenger vessels in Europe inland waterways transport is primarily on account of its superiority over rail and road modes, on grounds of efficiency and energy consumption. Energy consumed in per km/ton of good transportation through waterways is approximately 50% lesser than rail mode and 17% less than that of road transport. Furthermore, ensuring a high degree of safety even while transporting hazard prone goods, European inland waterways vessel market from non-passenger vessels is claimed to gain remarkable proceeds over 2017-2024. While speaking of the growth potential of inland waterways vessel market in Europe, it is imperative to mention some of the crucial details which experts believe has much to impact on the business dynamics. Statistics depict, inland waterways, which in early 1970s, accounted for almost 14% of freight transport in European countries, depreciated to 9% twenty years later, due to urbanization. Yet, experts believe, well equipped waterways, the Rhone and the Rhine in particular, are efficient enough to handle bulk traffic, provided solid investment is made in its maintenance and improvisation. While not exactly a roadblock, the hefty cost associated with this factor is somewhat standing as a stumbling obstacle in Europe inland waterways vessel market penetration. Nonetheless, stringent legislations enforced upon the ship owners with regards to carbon footprint abatement is expected to support the business growth. Moreover, a harmonized regulatory framework (Directive 2006/87) for issuing technical certificates to all inland waterways vessels of Member States, in all plausibility, would further scale up the profit margin of European inland waterways vessel industry.